A responsible executive who takes complete charge of organizing various events and functions is called as the Director of Events. Major roles and responsibilities listed in successful resumes include- identifying client needs, assisting in event goals, negotiating contracts, finding function venue, taking charge of event from concept to evaluation, handling budgets, preparing materials, promoting events, ensuring compliance with health and safety rules, hiring appropriate service providers, supervising and delegating tasks, negotiating with contractors and ensuring that the event operations run smoothly. 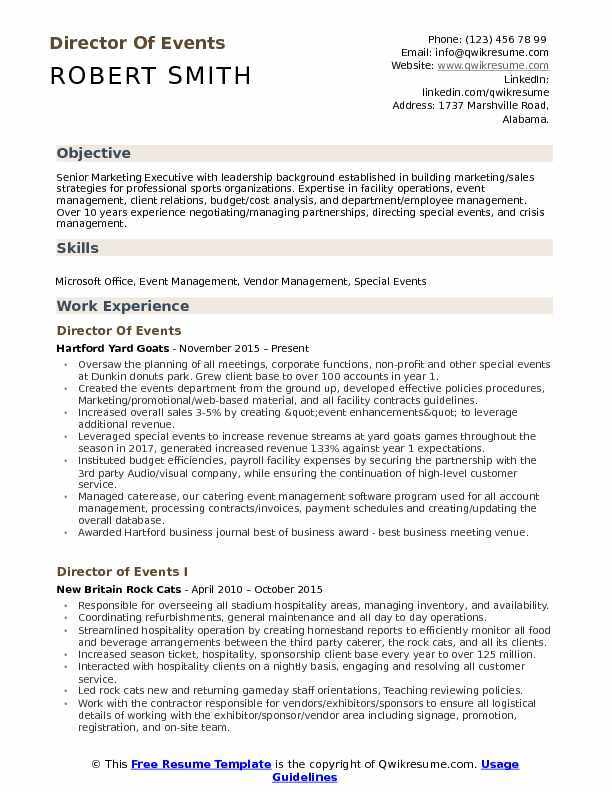 Director of Events Resume mentions essential qualifications such as – leadership, communication and strong negotiation abilities. Possessing an incredible aptitude for details and multitasking abilities are a boon for this role. Over and all, the events director should have sufficient knowledge of all aspects of event organization. 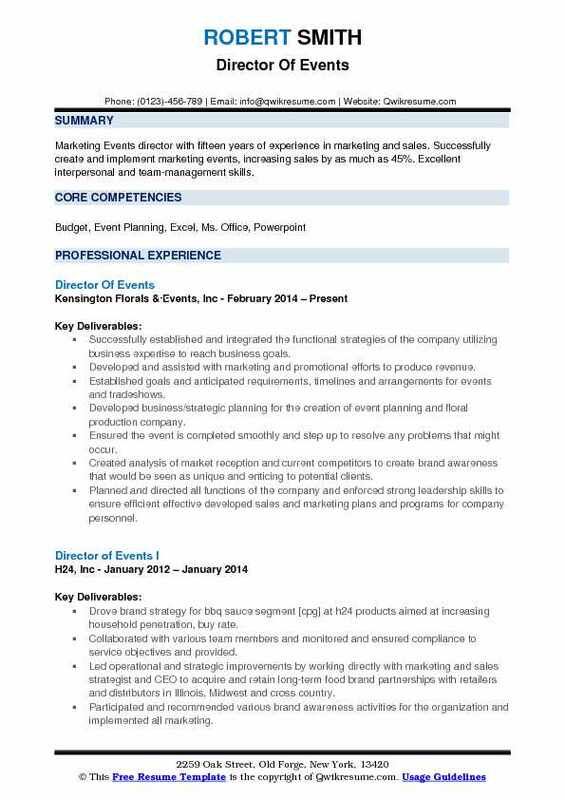 Companies hire their Director of Events who possess a college degree in the field of marketing, business or h.
Summary : Senior Marketing Executive with leadership background established in building marketing/sales strategies for professional sports organizations. Expertise in facility operations, event management, client relations, budget/cost analysis, and department/employee management. 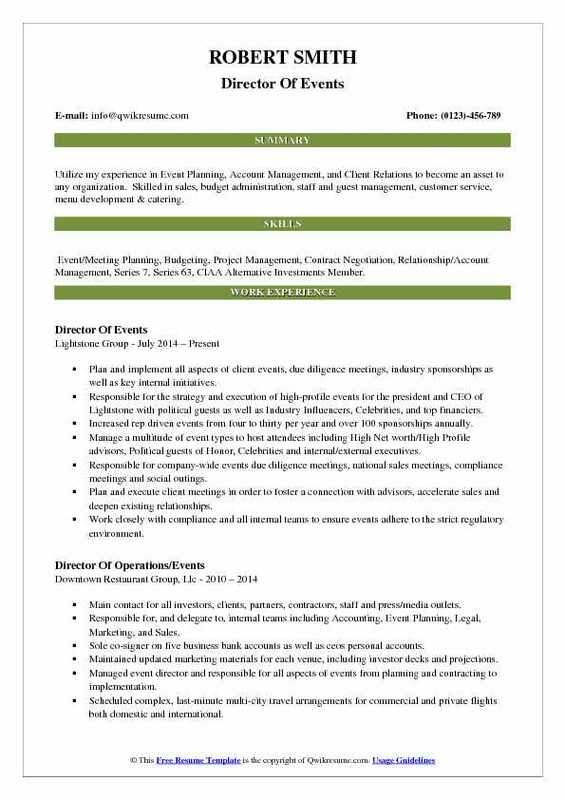 Over 10 years experience negotiating/managing partnerships, directing special events, and crisis management. Oversaw the planning of all meetings, corporate functions, non-profit and other special events at Dunkin donuts park. Grew client base to over 100 accounts in year 1. Created the events department from the ground up, developed effective policies procedures, Marketing/promotional/web-based material, and all facility contracts guidelines. Increased overall sales 3-5% by creating "event enhancements" to leverage additional revenue. Leveraged special events to increase revenue streams at yard goats games throughout the season in 2017, generated increased revenue 133% against year 1 expectations. Instituted budget efficiencies, payroll facility expenses by securing the partnership with the 3rd party Audio/visual company, while ensuring the continuation of high-level customer service. Managed caterease, our catering event management software program used for all account management, processing contracts/invoices, payment schedules and creating/updating the overall database. Awarded Hartford business journal best of business award - best business meeting venue. Improved overall performance by creating employee evaluation guidelines. Headline : Marketing Events director with fifteen years of experience in marketing and sales. Successfully create and implement marketing events, increasing sales by as much as 45%. Excellent interpersonal and team-management skills. Successfully established and integrated the functional strategies of the company utilizing business expertise to reach business goals. Developed and assisted with marketing and promotional efforts to produce revenue. Established goals and anticipated requirements, timelines and arrangements for events and tradeshows. Developed business/strategic planning for the creation of event planning and floral production company. Ensured the event is completed smoothly and step up to resolve any problems that might occur. Created analysis of market reception and current competitors to create brand awareness that would be seen as unique and enticing to potential clients. Planned and directed all functions of the company and enforced strong leadership skills to ensure efficient effective developed sales and marketing plans and programs for company personnel. Analyze market trends to determine the potential for growth while monitoring sales performance. Continuously updated and monitored online and social media presence to ensure all potential clients are reached. 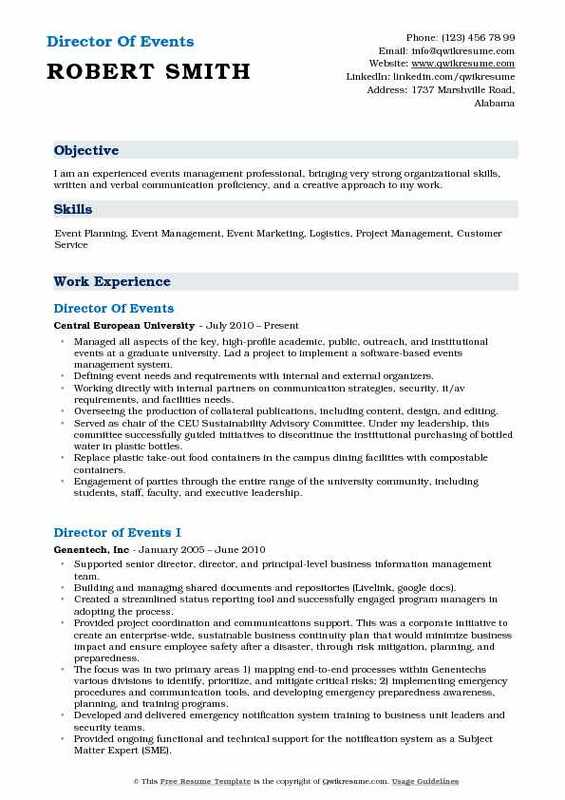 Summary : Utilize my experience in Event Planning, Account Management, and Client Relations to become an asset to any organization. Skilled in sales, budget administration, staff and guest management, customer service, menu development & catering. 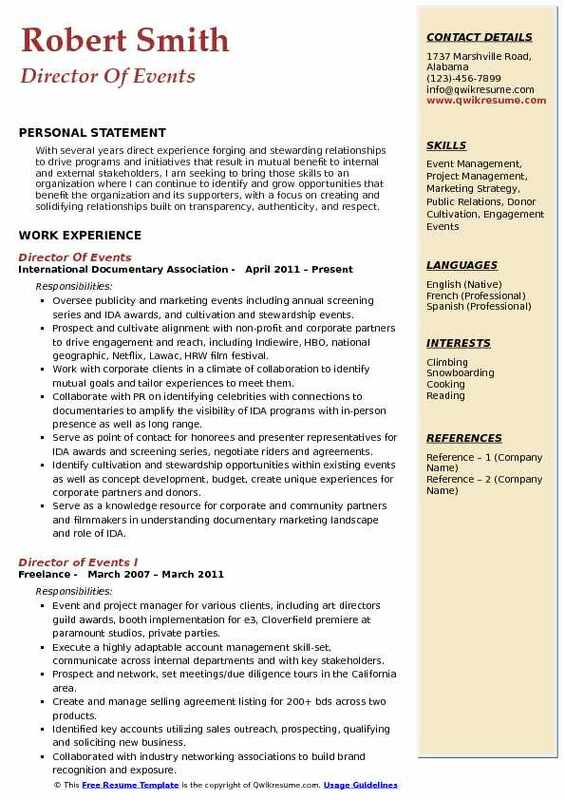 Skills : Event/Meeting Planning, Budgeting, Project Management, Contract Negotiation, Relationship/Account Management, Series 7, Series 63, CIAA Alternative Investments Member. Plan and implement all aspects of client events, due diligence meetings, industry sponsorships as well as key internal initiatives. Responsible for the strategy and execution of high-profile events for the president and CEO of Lightstone with political guests as well as Industry Influencers, Celebrities, and top financiers. Increased rep driven events from four to thirty per year and over 100 sponsorships annually. Manage a multitude of event types to host attendees including High Net worth/High Profile advisors, Political guests of Honor, Celebrities and internal/external executives. Responsible for company-wide events: due diligence meetings, national sales meetings, compliance meetings and social outings. Plan and execute client meetings in order to foster a connection with advisors, accelerate sales and deepen existing relationships. Work closely with compliance and all internal teams to ensure events adhere to the strict regulatory environment. Manage all aspects of each event including budget, site selection, hotel and vendor contracts, guest speakers, agenda creation, invitations, printed materials, av, powerpoint presentations, rooming list, room drops, flights/car service, confirmation emails and thank you gifts. Plan dine-around dinners all over the country for Lightstone sponsored events. 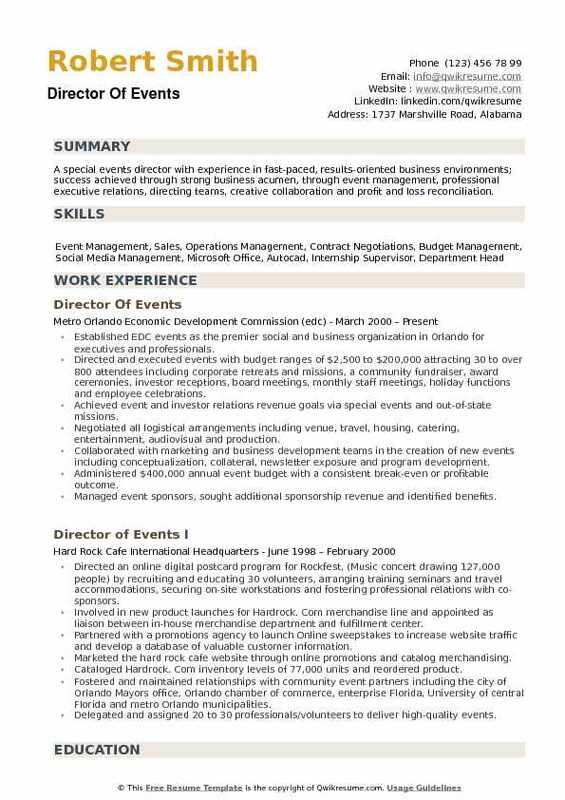 Summary : Successful Events Director, uniquely suited for developing and expanding event programs while curating unparalleled event experiences for our guests. Driven and dedicated to building a brand with growth strategies that deliver results. Progressive hospitality management and lifestyle company with a diverse collection of businesses throughout California. Established private events department with four event venues and catering for on-site and off-site clients. Increased sales revenue from zero to $1.3 million over the past 3.5 years. Implemented sales structure that maintained a 75% GP while minimizing food, beverage and labor costs. Produced and managed 250+ corporate and social events ranging in size from 75-550 guests. Developed new booking system and CRM to impact efficiency while growing client database to 5,000+. Managed full-time events manager, events coordinator, and on-call private event staff. Created sop and recruited, hired and trained the team on service standards and product expectations. Created annual budgets and implemented through contracting and sales strategies. Objective : Operations and events professional, experienced in the corporate market, with a proven ability to research, solicit and close business. Demonstrated ability to work in a fast-paced environment, build strong internal relationships and represent the company to clients and employees in a polished, courteous and professional manner at all times. A very clear understanding of hospitality marketing technology with an excellent attention to detail in every aspect of events as well as operations. Skills : MS Word, Excel, PowerPoint, Outlook; Lotus Notes; ETouches, Smartsheet, Employee Benefits Management Services. Assisted in structuring roles/responsibilities and standard operating procedures for our team of six. Launched chief legal executive’s first annual conference which included seven tracks, pre-event workshop, fashion show and sponsor dinners for 300+ attendees. In an effort to organize and keep track of revenue and expenses, I created and utilized a detail budget report. To keep track of expenses while also streamlining the ordering process, I created and implemented forms for food and beverage as well as for signage. Reviewed hotel contract to help maximize our cost savings as well as ensure we received appropriate concessions and event space. Tracked pick up reports for our room block and made/updated hotel reservations for staff as well as speakers. Assisted with the creation of the conference website through touches which included: registration questions, confirmation emails, venue information, speaker information page, ongoing conference agenda updates, uploaded speaker headshots/biographies and sponsor logos. Researched and acquired continuing legal education (CLE) credits for our annual conference. Managed 100+ speakers for our annual conference, responsibilities included but were not limited to speaker confirmation, placement on agenda, collection of speaker and session materials, panel prep calls and answered all logistical questions. 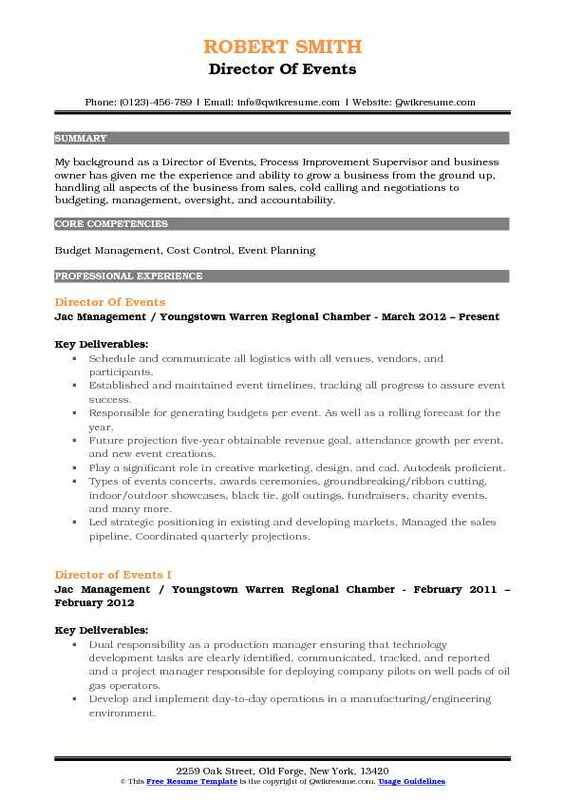 Summary : I am an experienced events management professional, bringing very strong organizational skills, written and verbal communication proficiency, and a creative approach to my work. Managed all aspects of the key, high-profile academic, public, outreach, and institutional events at a graduate university. Lad a project to implement a software-based events management system. Defining event needs and requirements with internal and external organizers. Working directly with internal partners on communication strategies, security, it/av requirements, and facilities needs. Overseeing the production of collateral publications, including content, design, and editing. Served as chair of the CEU Sustainability Advisory Committee. Under my leadership, this committee successfully guided initiatives to discontinue the institutional purchasing of bottled water in plastic bottles. Replace plastic take-out food containers in the campus dining facilities with compostable containers. Engagement of parties through the entire range of the university community, including students, staff, faculty, and executive leadership. Negotiation and mediation to overcome objections, by emphasizing benefits and solutions. Successfully lead a project to identify, evaluate and implement an events management tool and database system. Headline : I have over 5 years of experience in Event Production and Management. I bring experience from both the Public and Private sectors having produced and participated in multiple community-based events, nonprofit and for-profit events. My unique perspective allows me to approach events from both a public safety and a consumer/attendee point of view while incorporating the goals, interests, and obligations of my clients. Skills : Proficiency, meeting and exceeding targets, strong attention to detail, innovative thinking, extensive interpersonal skills and the ability to negotiate and secure contracts. Marketing, Training, Public Relations, Budget, Strategic Planning. 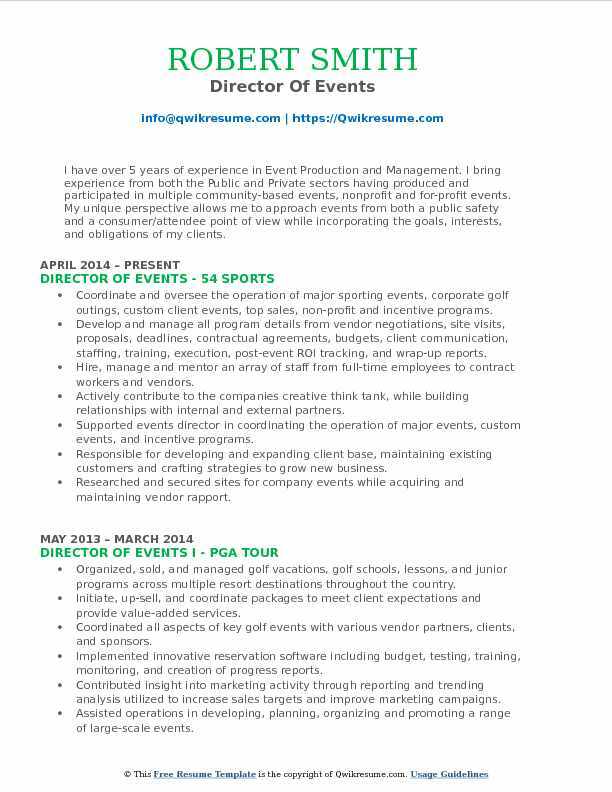 Coordinate and oversee the operation of major sporting events, corporate golf outings, custom client events, top sales, non-profit and incentive programs. Develop and manage all program details from vendor negotiations, site visits, proposals, deadlines, contractual agreements, budgets, client communication, staffing, training, execution, post-event ROI tracking, and wrap-up reports. Hire, manage and mentor an array of staff from full-time employees to contract workers and vendors. Actively contribute to the companies creative think tank, while building relationships with internal and external partners. 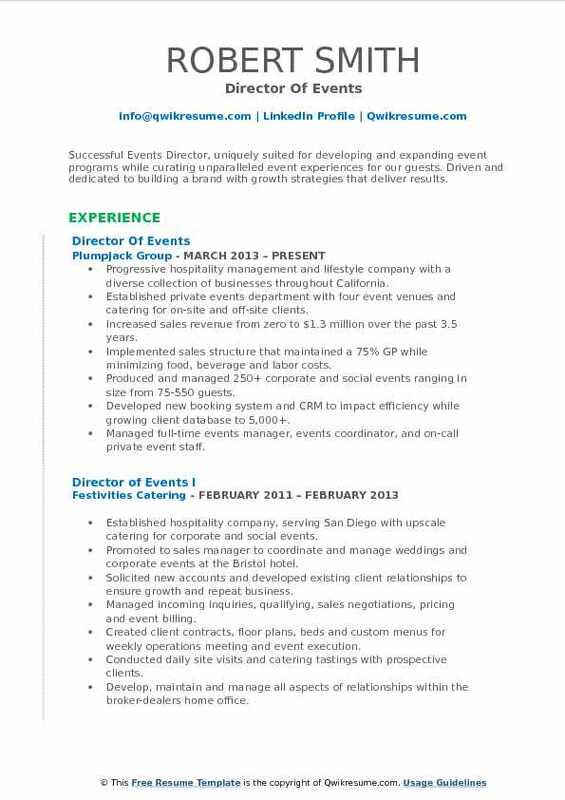 Supported events director in coordinating the operation of major events, custom events, and incentive programs. Responsible for developing and expanding client base, maintaining existing customers and crafting strategies to grow new business. Researched and secured sites for company events while acquiring and maintaining vendor rapport. Created, calculated and managed event budgets exceeding $750k to ensure quality through effective contract negotiations. Responsible for event logistics including transportation, client communication, talent, catering, staffing, equipment, training and management of on-site staff. 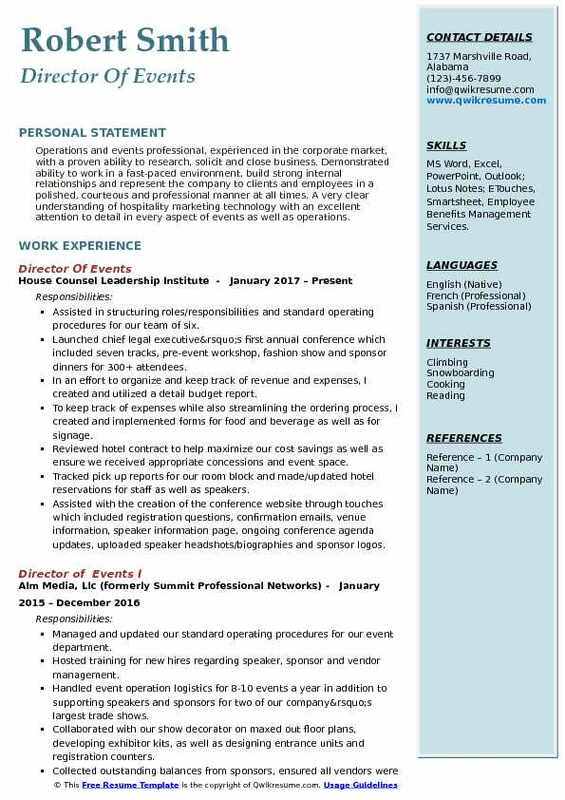 Summary : My background as a Director of Events, Process Improvement Supervisor and business owner has given me the experience and ability to grow a business from the ground up, handling all aspects of the business from sales, cold calling and negotiations to budgeting, management, oversight, and accountability. Schedule and communicate all logistics with all venues, vendors, and participants. Established and maintained event timelines, tracking all progress to assure event success. Responsible for generating budgets per event. As well as a rolling forecast for the year. Future projection: five-year obtainable revenue goal, attendance growth per event, and new event creations. Play a significant role in creative marketing, design, and cad. Autodesk proficient. Types of events: concerts, awards ceremonies, groundbreaking/ribbon cutting, indoor/outdoor showcases, black tie, golf outings, fundraisers, charity events, and many more. Led strategic positioning in existing and developing markets, Managed the sales pipeline, Coordinated quarterly projections. Created and led client history audit procedure. The goal was to identify past financials that would provide us with statistics identifying markets/clients that historically were more lucrative than others. Established operational growth by creating new efficient processes internally. Tasked with creating new rate sheets. Tasked with creating a new estimating process, focus on priority and efficiency. Summary : With several years direct experience forging and stewarding relationships to drive programs and initiatives that result in mutual benefit to internal and external stakeholders, I am seeking to bring those skills to an organization where I can continue to identify and grow opportunities that benefit the organization and its supporters, with a focus on creating and solidifying relationships built on transparency, authenticity, and respect. Oversee publicity and marketing events including annual screening series and IDA awards, and cultivation and stewardship events. Prospect and cultivate alignment with non-profit and corporate partners to drive engagement and reach, including Indiewire, HBO, national geographic, Netflix, Lawac, HRW film festival. Work with corporate clients in a climate of collaboration to identify mutual goals and tailor experiences to meet them. Collaborate with PR on identifying celebrities with connections to documentaries to amplify the visibility of IDA programs with in-person presence as well as long range. Serve as point of contact for honorees and presenter representatives for IDA awards and screening series, negotiate riders and agreements. Identify cultivation and stewardship opportunities within existing events as well as concept development, budget, create unique experiences for corporate partners and donors. Serve as a knowledge resource for corporate and community partners and filmmakers in understanding documentary marketing landscape and role of IDA. Develop connections with journalists connected to film industry to engage as moderators for programs, as well as to open up communication about IDA's work. Develop program budgets, timelines and deliverables and manage internal direct reports as well as third-party vendors and contractors (including event producer and talent executive). Summary : A special events director with experience in fast-paced, results-oriented business environments; success achieved through strong business acumen, through event management, professional executive relations, directing teams, creative collaboration and profit and loss reconciliation. Established EDC events as the premier social and business organization in Orlando for executives and professionals. Directed and executed events with budget ranges of $2,500 to $200,000 attracting 30 to over 800 attendees including corporate retreats and missions, a community fundraiser, award ceremonies, investor receptions, board meetings, monthly staff meetings, holiday functions and employee celebrations. Achieved event and investor relations revenue goals via special events and out-of-state missions. Negotiated all logistical arrangements including venue, travel, housing, catering, entertainment, audiovisual and production. Collaborated with marketing and business development teams in the creation of new events including conceptualization, collateral, newsletter exposure and program development. Administered $400,000 annual event budget with a consistent break-even or profitable outcome. Managed event sponsors, sought additional sponsorship revenue and identified benefits. Examined and evaluated each event to determine effectiveness and value to the EDC. Interacted daily with the management team and community leading CEOs, government officials and school superintendents.